BASE STONE is a dedicated type 4 dental stone for basing dentate arches and opposing models. Due to its adaptable viscosity, BASE STONE can be used in a thin fluid or thixotropic consistency without change in physical properties. Together with Fujirock EP Classic and Premium, you can create shade combinations that form the foundation of your aesthetics. 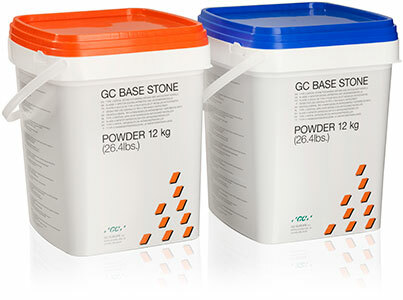 BASE STONE is the perfect choice for a wide range of indications such as basing dentate arches, opposing model, study model etc. The two colours Terracotta Red and Royal Blue meet the requirements for individualized and aesthetic construction of master models.